Istanbul is a glory of world travel. This splendid collision of civilizations swells up on seven hills bridging two continents, mingling the mystique, power and glitter of Roman, Byzantine and Ottoman Empires. These are good times to visit Turkey. The Pound, Euro and Dollar are strong against the Turkish Lire. At the time of writing, early Jan 2019, £1 bought 6.99 TL, by far the best exchange rate I have known in 30 years of travel to the country. It doesn’t always follow that goods and services are cheaper by the same measure, but there is little doubt that your visit will cost less than it did a few years ago. In the hot Turkish summer, most people will choose to take their break on the holiday coast, in the south or south west. The very idea of a summer city stay, baking heat, oppressive humidity, traffic pollution, would shock the average visitor from the North. But Istanbul is not the regular city. The former capital of the ongoing Roman Empire, after the collapse of Rome, then of Byzantium, was built on the watery divide between Asia and Europe. No structure of any historical value is more than several hundred metres from the water, the Bosphorus, the Black Sea or the Sea of Marmara. City air is constantly refreshed and replenished by breezes and zephyrs off the water. And on hot summer days there’s always the option of taking to the water on one of the many ferries that cross from shore to shore. 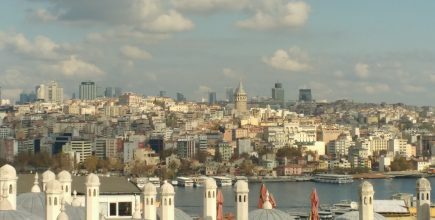 This is my account of Istanbul. 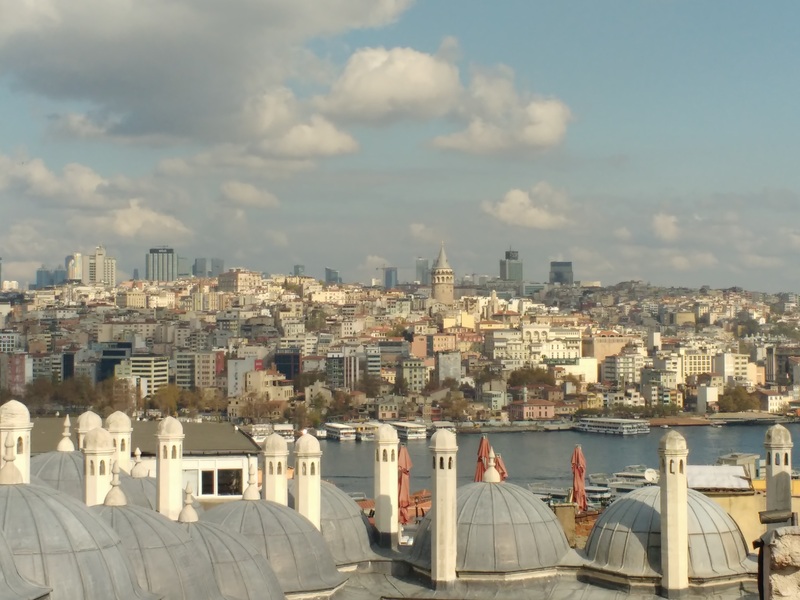 Istanbul can seem huge and daunting, but if you crop it down to its essential ancient heart it is as manageable as London or Paris. Anchor your visit on one remarkable piece of public transport, the T1 tram, and it makes excellent sense. The trams ply from Kabatas, (the stop for Dolmabahçe Palace), and over the Galata Bridge, its parapets a perpetual smudge of fishermen. Then it’s up the hill to a string of stops each a short stroll to yet another wonder. Hop off at Gulhane station for the Topkapi Palace. The Sultanahmet stop serves Hagia Sophia. Beyazıt is right outside the Grand Bazaar. Aksaray serves the wonderful Roman aqueduct of Valens. (With the Istanbul Card, about 60p a trip). Return to Kabatas for the F1 Funicular to Taksim Square. Start your visit with a ferry trip from Eminonu Pier and look back from the Bosporous to a sublime vista of Sultanahmet (Old City), dominated by the Topkapi Palace, the vast dome of Aya Sofya, once the greatest cathedral in Christendom, and the Blue Mosque. It’s 20 minutes over the water, with the occasional stop to let some towering freighter roll down the sea lanes from Russia to the Mediterranean. Take a break in one of the many pier-side cafés on the Asian shore in Harem, then head back to Eminonu for the remarkable T1 tram, the tourist’s reliable thread through history. Three Daughters of Eve, written by Elif Şafak, is set in Oxford and Istanbul. Its characters are three Muslim women, several men, and it deals with one big question. My account. Work on renovating Istiklal Caddesi, one off the great showpiece shopping streets, was completed in 2017 (December). This pedestrianised mile and a half avenue is lined with gracious mansions (embassies, once, before they were moved to the new capital Ankara) and many smart shops, with interesting little side streets leading off. 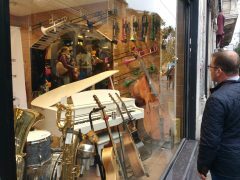 One, for example, is devoted entirely to musical instrument stores. And trundling down the middle is the restored antique tram, now on vibration free tracks. It runs from Taksim Square to Tunel, connecting with the underground train down to Galata, on the Golden Horn. On Istiklal Caddesi we stopped for afternoon tea at Mado, where the choice of cakes was prodigious. The restored antique tram trundles down the middle on its new vibration-free tracks to Şişhane, where it connects with the underground train down to Tünel, near Galata Bridge. The Istanbulkart (Istanbul Card) covers all public transport, including ferries, at about 60p a trip. Buy it at machines at airports, stations and at newsstands. More than one person can use the same card – just pass it across the barrier to the others with you. Take the T1 up the hill to a string of stop, each a short stroll to yet another wonder. Alight at Sultanahmet stop for the phenomenal Aya Sofya. Built in 537, this was the greatest cathedral in Christendom for 900 years. After the Turks took over in 1453, it was a mosque for 500 years, becoming a museum in 1935. Do pay extra to jump the (usually) long queue. Once inside, find a quiet vantage point in the gallery to marvel at the mighty columns and massive Byzantine mosaics. There’s a cosmic choice of small, family-run restaurants and cafés. For lunch based on the many Turkish mezzes, try one of the busy places around the Spice Bazaar, next to the New (17th Century) Mosque. Or grab a superior sandwich, olive oil-fried fresh fish, inside a hunk of new-baked bread, at a stall just before the Galata Bridge. Fast food perfection. Time it right and you step off the T1 tram at the Grand Bazaar (Beyazıt stop) to a tremendous quadraphonic sound effect, as four müezzin compete to call the faithful to prayer from four separate surrounding mosques. Then plunge into one of the world’s biggest and oldest covered markets, brimming with infinite choice in 3000 shops over 60 aisles. 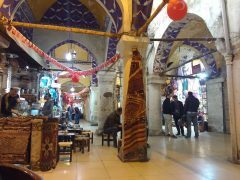 The high quality products include cotton hammam towels, hand woven in Turkey, and exquisite prints of whirling dervishes. Then break for Turkish tea and paklava in one of the many cafes. It’s a short walk from Seraglio Point to Kumkapi, below the old city, its streets teeming with fish restaurants. It’s a 10 minute walk from Beyazıt tram stop to the monumental Suleymaniye Mosque, past pampered cats lolling on doorsteps of quiet side streets, and strutting the hot stones disdainfully. There’s a string of busy, welcoming open air restaurants (waiters with perfect English) directly west of the mosque. I recommend the Ali Baba. Ride the T1 to Aksaray for the Valens Aqueduct, the city’s most striking (if restored) Roman relic. Next stop the underground Basilica Cistern ( Sultanahmet tram stop), a refreshing diversion on a hot day. It’s the perfect Phantom of the Opera setting – damp, dripping and eerie, under 1500 year old brickwork. Then take the the T1 tram back over the Galata Bridge, its parapets a perpetual smudge of fishermen. It spans the Golden Horn, the inlet from the Bosporus into old Istanbul. Alight at Kabataş for the funicular (F1) to Taksim Square. Agatha Christie did not wish to be disturbed in room 411 in the Pera Palace Hotel. 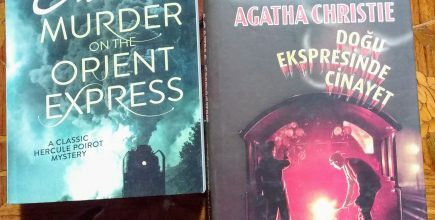 It was 1934, and in her elegant sanctuary she was finishing Murder on the Orient Express. Cruelly she denies Poirot even one night here. (The hotel is The Tokatlian in the book.) No sooner does he check in than he has to rush off to Sirkeci Station to catch the train, and solve the crime. However he does have time for a drink in the bar, still a place of sumptuous repose, where a photo of Christie hangs above another patron, Sir Edward Elgar. There an air of well-practised luxury throughout, with so little changed, apart from the standard fine hotel comforts, since the hotel was built in 1892 for passengers from and for the famous train. Cases display the mementoes of an illustrious past, along with original copies of the thriller. And you can book Agatha’s favourite 411, left much as it was when she finally checked out. 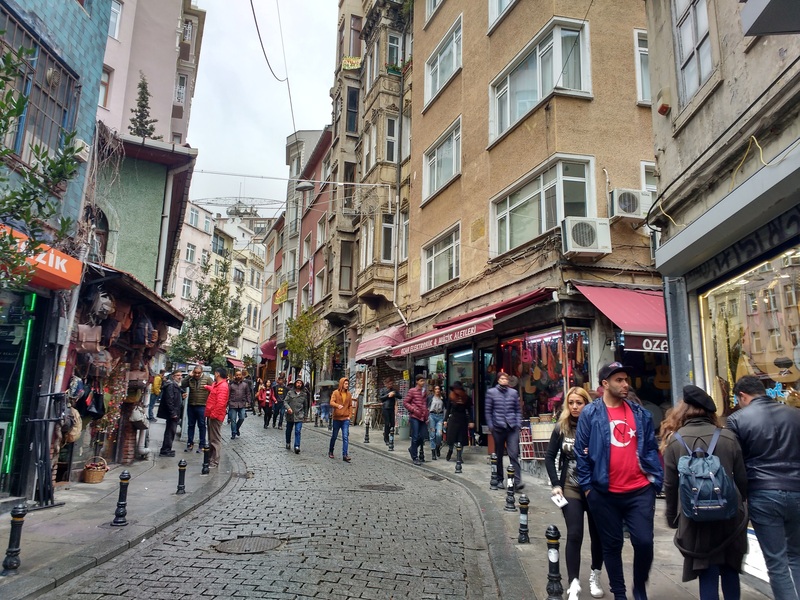 Beyond the towers and palaces and grand mosques of Istanbul there is a discreet alternative city, in the steep side streets of Beyoğlu (Şişhane station). It’s a place of tight, tiny, often hilly backstreets, overhung with faded wooden houses. Artisanal shops and independent cafes hold out defiantly, amid the surge of glossy new buildings. Nothing quite expresses the spirt of the old city like the Museum of Innocence on Çukurcuma Caddesi, set up in a 19th-century home by Nobel Laureate Orhan Pamuk who wrote the book of the same name in 2008. The treasures here aren’t gold or rare gems, but unremarkable objects, such as cinema tickets, old doorknobs, ornaments and yellowing photographs, the minutiae of life in the city from 1950 and 2000. For a break from Istanbul‘s flat-out commotion, the car-free Princes’ Islands are just 55 minutes away by the fast ferry from Beşiktaş (use Istanbul Card). Even if, like Poirot, you can’t stay, make time for a drink in the bar of the Pera Palace Hotel. A photo of Agatha Christie hangs in this sumptuous haven. 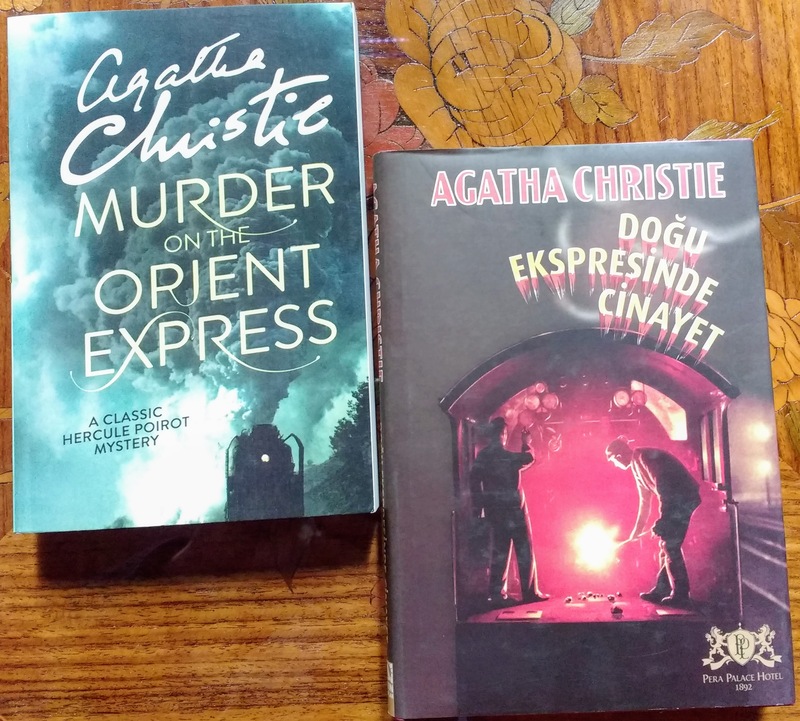 Little has changed since 1934, when Christie finished Murder on the Orient Express in Room 411 of the hotel (the Tokatlian in the book), built in 1892 to serve passengers from, and for, the famous train. 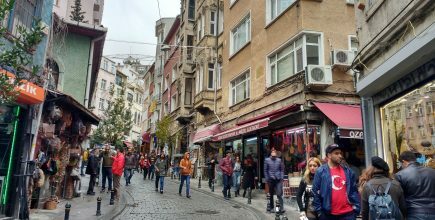 There are many evening dining options in the streets around, and on nearby Istiklal Caddesi. Gareth stayed as a guest of the Hotel Pera Palace Jumeirah.